XviD is a common kind of video codecs following the MPEG-4 standard, while MOV is a universal multimedia container format for storing multimedia contents. Maybe you have noted that you might have a lot of movies or videos wrapped with XviD codec, such as AVI files. 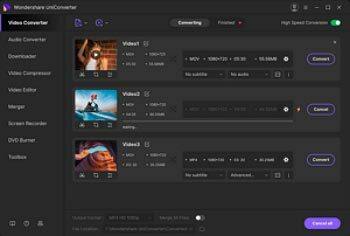 If you want to convert these XviD-encoded files to QuickTime MOV format for playback in QuickTime or editing in iMovie etc., it'll be very easy as long as you have a powerful XviD to MOV converter. Have little known about the knowledge of video codec and video format? And fail to find such a useful tool to help you convert XviD to QuickTime MOV? Don't worry. 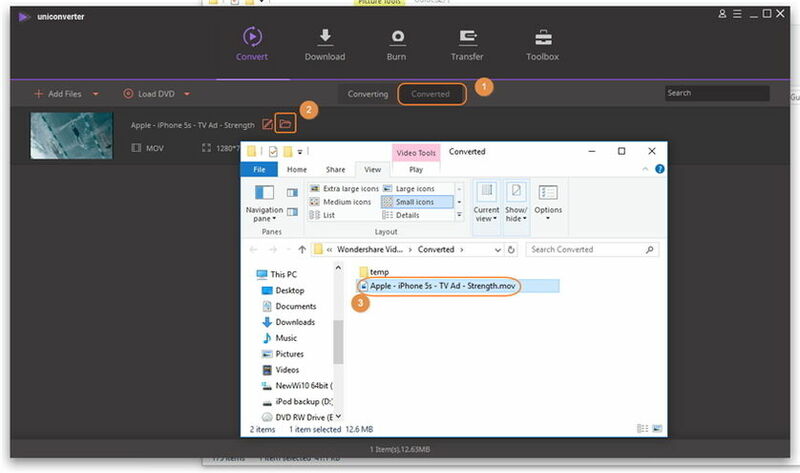 Here, I directly teach you how to accomplish the job in Windows platform in the following tutorial, which introduces a powerful XviD to MOV converter to you. But, both Windows and Mac version of this app is available by clicking the below URL. The Mac Xvid to MOV converter is available for any Mac running Mac OS X Mountain Lion, Lion etc. Directly drag one or more XviD files to this program. 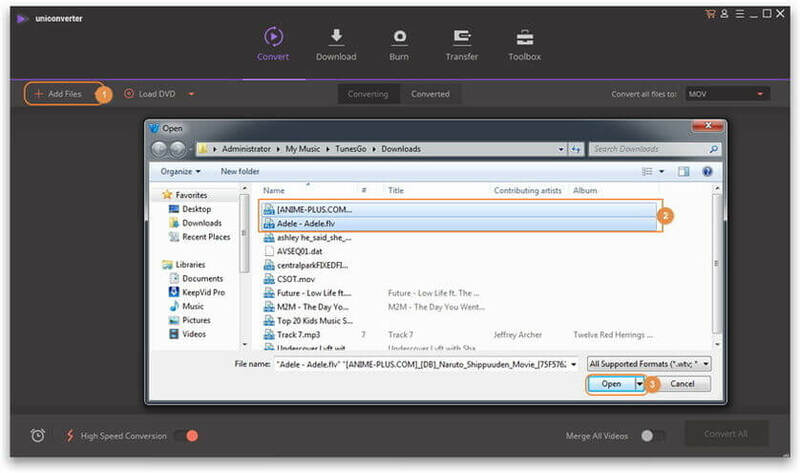 Go to Convert > Add Files to load the XVID files you want to add. This smart XviD to MOV converter allows you to import several XviD files, for this app supports batch conversion. Click the icon to expand the output format list, click Video tab and choose MOV from the left side bar, and then select the video resolution in the right to confirm the output format. Then you need to set H.264 as the video codec in the "Settings" dialog window. 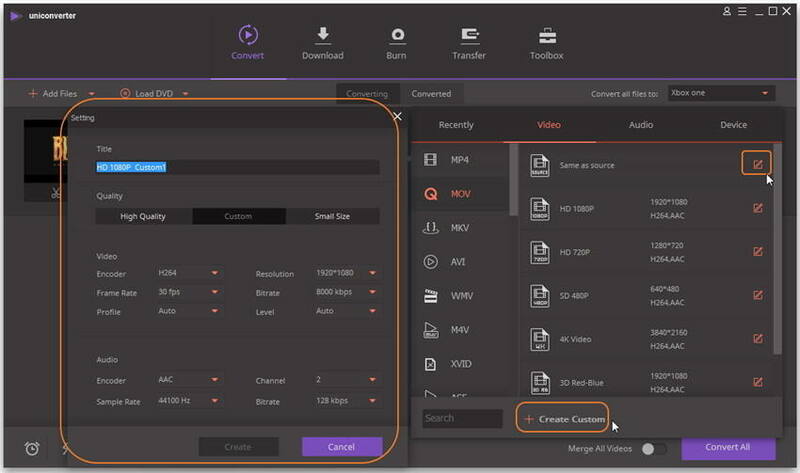 Then click + Create Custom to set H.264 as the video encoder. When everything is done, you just need to hit Convert button to convert XviD to MOV QuickTime). After the conversion, you can find this output MOV H.264 video by switching to Converted tab. You'll be surprised to find that the converted MOV is fully supported by Apple products like iTunes, iPhone, iPad etc. MOV format can hold a video track and an audio track at the same time into a single file. And the video codecs the MOV files use have H.264, MPEG-4, and also XviD etc. 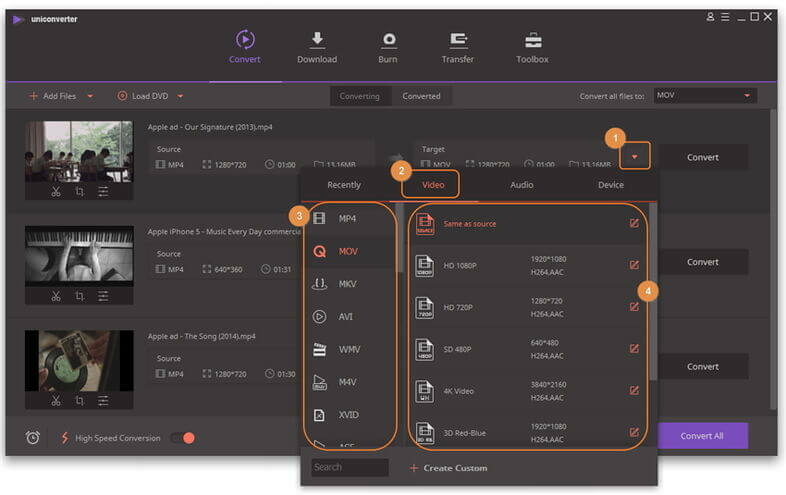 However, as all know, only the MOV files with H.264 and MPEG-4 video codecs can be recognized by Apple products, such as iTunes, iPhone, iPad, video-capable iPod and Apple TV. So for the ones who want to convert XviD to MOV in Windows or Mac (Mountain Lion supported), it's right to select H.264 codec when customizing video codecs.